An identity in Mac Outlook 2011 is the set of data which includes the accounts, contacts, email messages, calendar, notes,tasks, categories, signatures, and rules. 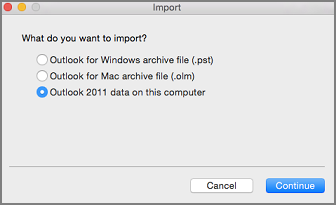 Mac Outlook 2016 imports Outlook for Mac 2011 identities, this process is a bit typically and is used while upgrading Outlook 2011 to Outlook 2016 for Mac. Step1 : In Mac Outlook 2016. Step2 : Go to Tools tab >> and Select Import. 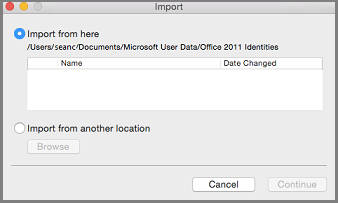 Step3 : Now, you will get a Import box >> Select the option of Outlook 2011 data on this computer >>Click on Continue. Step4 : Now, browse the location of the identity to import. First option is: Import from here, it is the default location i.e. The second option is Import from another location, it will allow to browse the Mac for the identity. Step5 : Click on Continue. All the imported items including the accounts, emails, contacts, calendars, tasks, notes,signatures, rules, and categories will appear in the same location as they did in Outlook for Mac 2011.